At JAN-PRO Vancouver, we strive to consistently offer the best value for professional cleaning in the Vancouver area. We recognize that each business has its own cleaning needs. That’s why we offer a range of customizable professional cleaning packages to fit our client’s budgets and unique requirements. Our customers enjoy a consistent, thorough clean every time their dedicated JAN-PRO cleaning crew visits their location. With affordable janitorial services from JAN-PRO Vancouver, you can feel confident knowing that your facility has been cleaned properly and thoroughly with the latest in cleaning technology, by highly-trained staff. Our environmentally friendly cleaning methods won’t pose any risk to your employees or guests, and won’t damage any surfaces within your property. Your space will be healthier, cleaner, and your furniture and fixtures will last longer when you choose JAN-PRO for your commercial cleaning services. JAN-PRO Vancouver has been providing professional office and commercial cleaning services to the Lower Mainland since 2004. Every cleaning program is customized to meet the specific needs of your workspace, and is carried out by our fully-trained and insured, JAN-PRO cleaning teams. JAN-PRO’s work is guaranteed. If you are ever dissatisfied with your scheduled cleaning, we will complete the service again in a timely manner and at no additional cost. We’re serious about our customer care! JAN-PRO Vancouver is a Better Business Bureau Accredited Business. We are also WorkSafe BC compliant and a Member of the Burnaby Board of Trade, ComplyWorks. Our cleaning services can be tailored to meet the needs of different businesses such as offices, restaurants, retail storefronts, large warehouses, educational facilities, medical facilities, and property-managed locations. In addition to using professional-grade cleaning materials (including green certified chemicals and hospital-grade disinfectants) to treat your facility, we also offer electrostatic disinfection and electrostatic microbial coating using our exclusive EnviroShield™ system. Give us a call at (604) 430-4229! 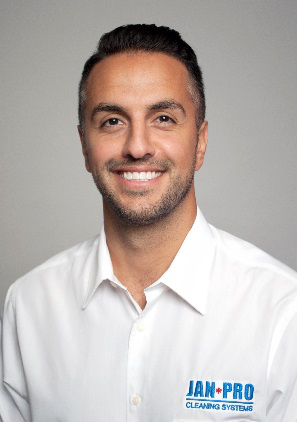 Owner Essi Yeganegi served as the General Manager of JAN-PRO Vancouver for over five years, overseeing all aspects of the business. In 2017, he decided to take a leap and fulfill his goal of owning and growing a business, and acquired the JAN-PRO territory of Greater Vancouver. As Master Franchise Owner, Essi believes in focusing on training and developing franchise partners, and delivering superior customer service. Essi and the JAN-PRO Vancouver team enjoy an excellent reputation among customers and have a customer retention rate of over 96%. The team at JAN-PRO Vancouver looks forward to providing the best commercial cleaning services to the Vancouver area for years to come.